I finally had the amount of time needed to write this blog. YAAAAY!! Well this one, and one coming up after. You see- the blogs I write with recipes are A LOT harder to write! Everything is more precise. I can't just go with the flow and write whatever comes to mind within the perimeters of whatever the blog topic is. With recipes I have to make sure that I'm writing clearly and perfectly understandable- I want you to be able to envision yourself baking along with me. So I guess in a way, it takes a lot more brain power which I'm not always able to give. *Will have enough to make a lattice on top if you wish. 1. In a bowl of an electric mixer fitted with a paddle attachment, add your spooned and leveled flour, salt, and sugar. 3. Turn your mixer down to low and SLOWLY add your ice water (omitting ice!!) little by little until the dough JUST comes together and starts to pull away from the bowl (DO NOT OVERMIX WHAT SO EVER). I said "ish" in the ingredient list because depending on where you live and the weather the day you do this, your water amount will change. Just add a little at a time until you achieve desired look. As soon as it does this, STOP mixing! 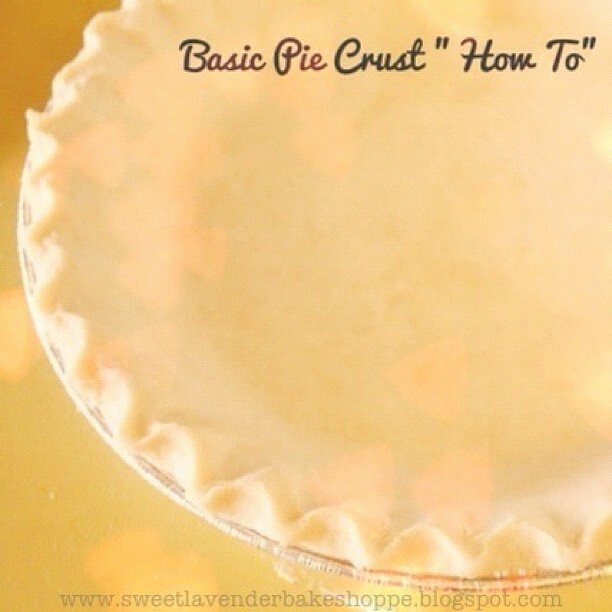 You can easily over mix- which will result in a less flaky crust. 4. Pull dough out of bowl onto a floured surface and gently pat together into a ball. Wrap with plastic wrap and chill in your refrigerator for 15-20 minutes. 5. When the dough has chilled, pull out of fridge and roll out on a floured surface until you have a circle about 1/4" thick. Take your 9" pie dish and place upside down- you want the dough to exceed the pan about 2 inches at least, on all sides. 7. Gently press dough into pan, making sure to get into the bottom well. Then with a sharp knife, cut the excess dough off as you go around your dish. SAVE THESE SCRAPS! You can either make a lattice with them, make cut-outs to top your pie, or do this. A. You can achieve this by squeezing with your index finger and thumb from one hand into the thumb of your other hand. B. You can get this look by gently pressing your index finger or thumb into the dough. C. You can achieve this by taking the back side of the prongs of a fork and very gently pressing into the edge of the dough. 8. Now it's up to you what to do! Will you par-bake? Will you fully bake it and fill with a cream? Or will you pour into the raw crust a silky smooth custard mix and then bake? Whichever you do, it will definitely be delicious! Yes this dough can be doubled! And yes you can make, and freeze! If you freeze as a ball of dough, please defrost overnight in fridge. If you freeze as a raw crust in pan, no defrosting necessary! Just wrap in plastic first. I am going to use this crust to make my pecan pie this Thanksgiving for my in laws and I thought I might share my recipe with you because it is the only pecan pie I've ever liked and I have never seen anyone bake it the way I do. I also have no blog to post this on but I feel bad because everyone eats lame pecan pie and it gives it a bad name darn it. So please just make it and try it because it's kinda yummy. Hey! Thanks!!! I have to admit- I LOVE Pecan Pie. Like, LOOOOOVE it! I will definitely try your recipe out! Thanks for the generosity fellow baker! Don't forget you can always wash the berry, dry completely, and then place in a freezer bag and freeze! Then you'll always have yummy berries throughout the year! I've tried doing that, but I eat them too fast! I'm so addicted! P.S. Did you know Noel was on Dawson's Creek the first season? I flipped out when I saw DC on Netflix and I'm re-watching it! I haven't seen it since it first came out!!!! Did you just say Dawson's Creek is on Netflix? Oh my poor sweet husband. He's going to relive my 8th grade year all over again. HUZZAH!!!! D to the Awson! Living it up Capeside Style!